Yakuza 4's total cutscene length is going to be nearly four times longer than that of Dragon Age II. 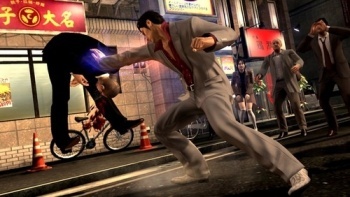 Sega's upcoming Yakuza 4 is set to feature some major action. But it's been revealed that the game will also feature over six hours of cutscenes to watch. The game will feature a total of 384 minutes of cutscenes, which is almost four times as much as Dragon Age II is set to include. This information came to light via Britain's game-ratings group, the BBFC. The group assigned an "18" rating to the game. The game received the ranking because of "strong bloody violence and strong language."